Guess what? Another TS Christmas knitting project! I made a PDF of the pattern quite a while ago (from a library book) but when I went to start my project, I only had the last of five pages. I still have no idea how that happened. I requested the book again and it took days and days and days to get to my branch. Stitches delighted in jumping off the needles. 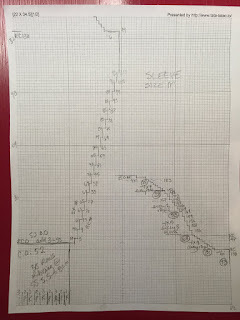 In converting my hand-knitting pattern for my machine using basic knitter's math, I failed to note that the sweater is supposed to be 45cm from the bottom of the sweater to the armscye, including 6cm of ribbing. 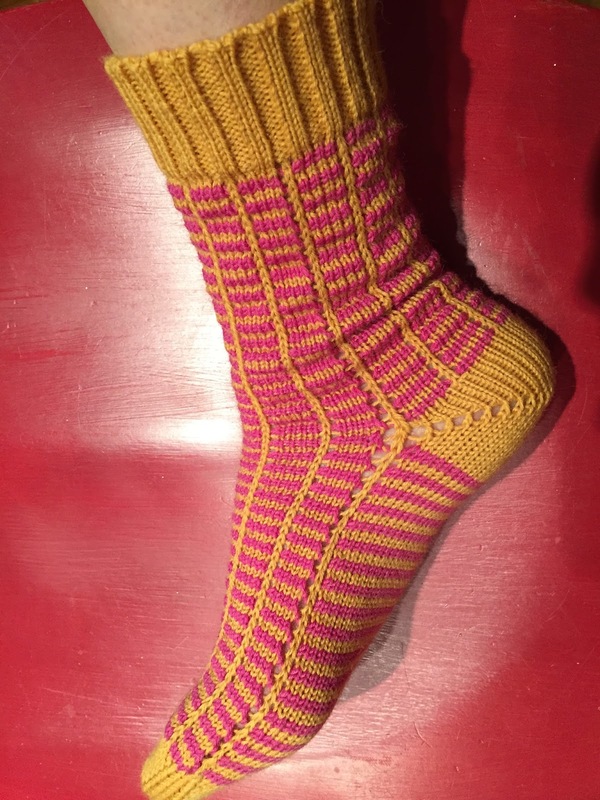 I knitted 6cm of ribbing and then 45cm of stockinette. And then I washed and blocked the first front and DID IT AGAIN before noticing. 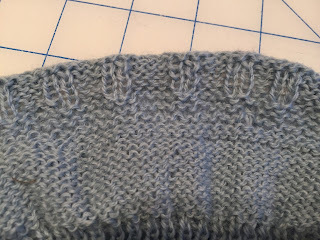 By the light of day it was obvious I should frog back because he would not like a sweater that was too long and let's face it - if you have a knitting machine, reknitting is a lot easier than connecting two bits of knitting invisibly by hand. And in the end it was really fast; so not worth losing hours of sleep over. Given all of this, I'm really pleased with the finished project. I managed to go straight from the ZZ cast on row to a 3x2 ribbing pattern (this involves lots of transferring stitches between beds). 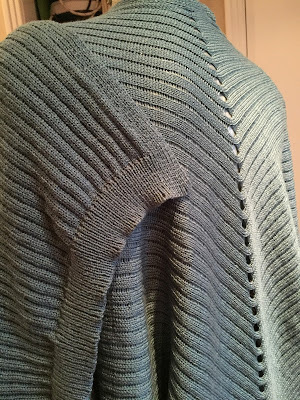 I managed to knit ribbing up through the body of the sweater without any obvious gauge problems (I knit the back bed purl stitches on stitch size 6 when the front bed was SS 8). 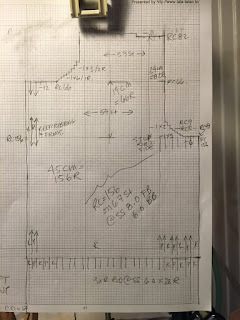 I accurately (subject to my mistake noted above) graphed the pattern and worked from these diagrams. But the source of most happiness is how well the collar turned out. 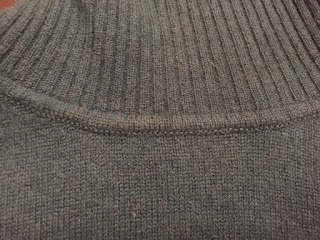 The pattern called for a standard hand knitted collar which in part (at CF and CB) was knitted straight from the body pieces rather than from cast off edges. 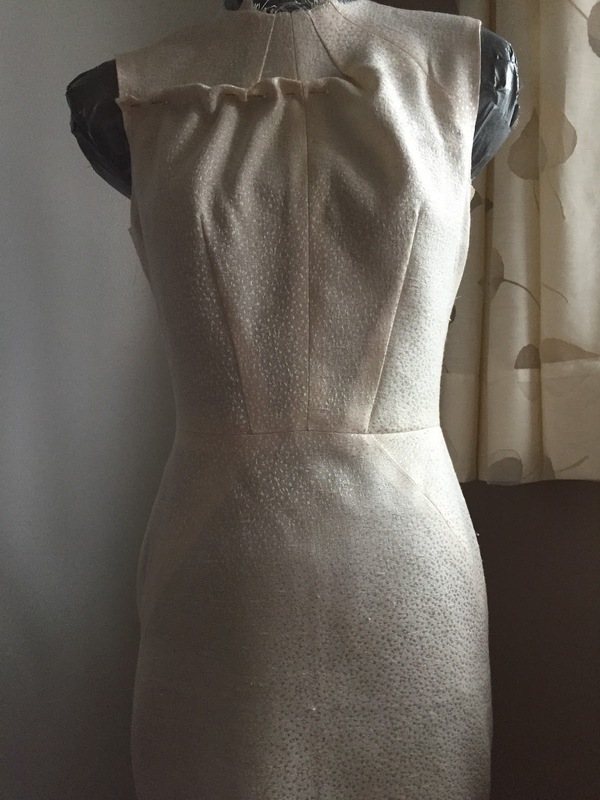 The collar is in the 3x2 rib pattern and doubled (i.e. 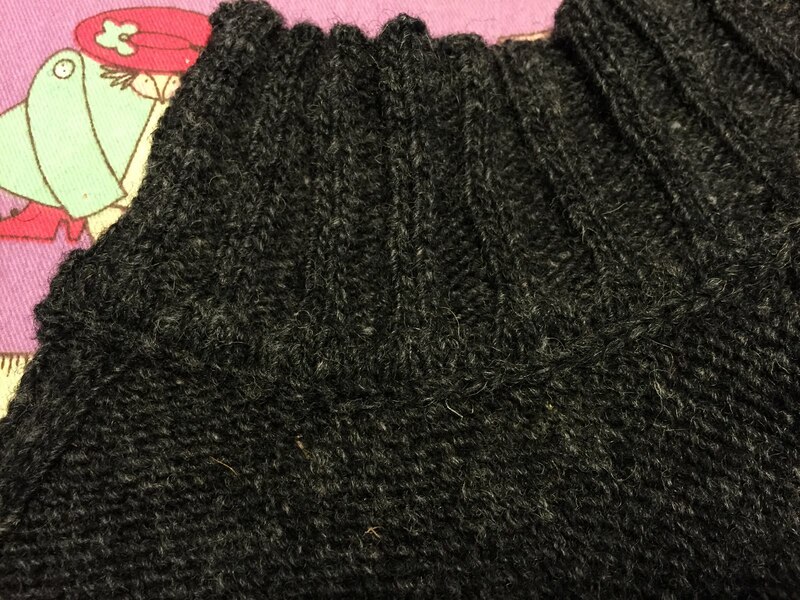 knitted 12cm, then the cast off edge is sewn to the neck edge on the inside). This would make a facing to hide the top of the zipper tape on the inside. 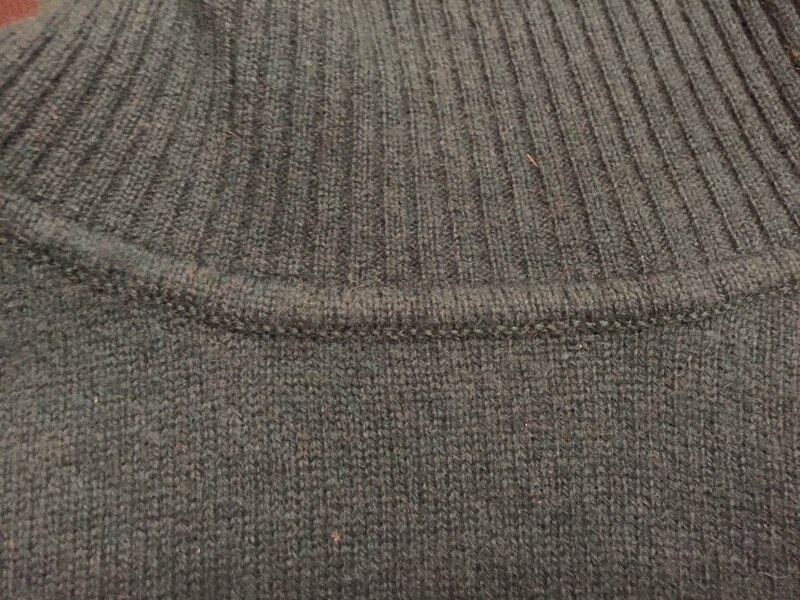 I wanted a single layer collar (2 layers of Briggs & Little would be too much), and I wanted it to attach the same basic way as the turtleneck of a commercially made cashmere sweater I own. 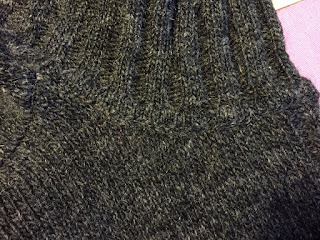 See, there is a single layer of ribbing, and it is knitted directly to a few rows of stockinette - both inside and out - and those stockinette stitches are neatly sewn together through the body of the sweater. Neat huh? Except I am lacking the machine (a linker) that does this kind of sewing, and I wasn't 100% sure how to knit the little stockinette flanges directly onto the ribbed collar. But I did it! I'm so chuffed! For anyone with a Passap, here is how. After knitting the number of rows of ribbing I needed for 6cm, I filled in the missing 2 stitches of each purl column on the front bed by hanging the purl bump (from the row below) for the adjoining stitches on the empty needles. I did the same re the missing 3 stitches of the knit columns on the back bed, but I left the centre needle empty. Then I set the lock to knit circularly (CX/CX) at a stitch size between that of the ribbing (6) and the main knitting (8) - just to keep it a bit firm. I knit three rounds (6 passes) and then some rows of waste yarn. 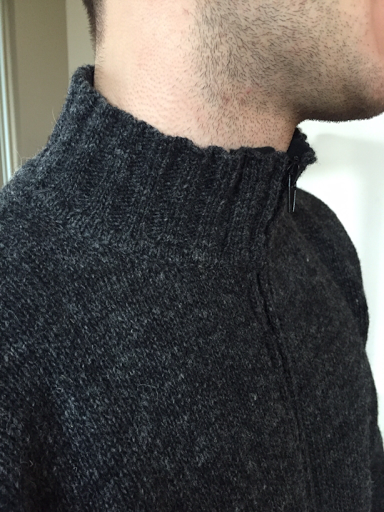 To attach the collar, I hand basted the wrong side flange to the inside of the sweater neckline. Then I very carefully chain stitched the three layers together with a crochet hook, making sure the hook went through the matching loops of the last row of the Briggs & Little. I had to fudge a tiny bit at the CF edges to keep them relatively straight. Subject to that, IT WORKED PERFECTLY! 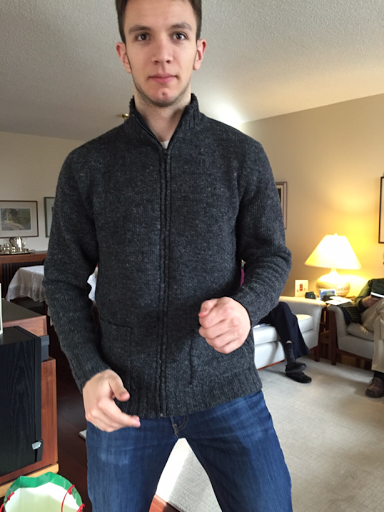 I sewed the sweater together and installed the zipper with my sewing machine. To keep the inside of the neck neat and make it soft, I added a little fleece facing. You know Cidell? She and I egg each other on about machine knitting. 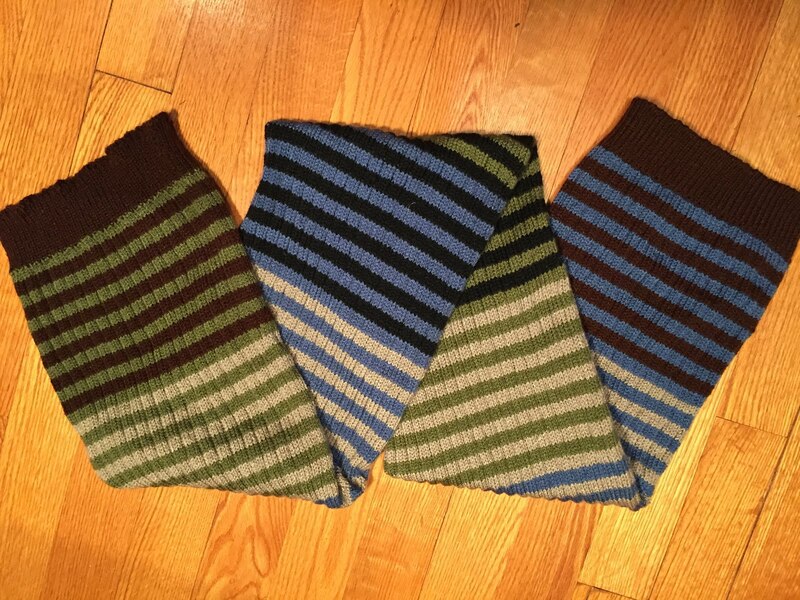 I really like that simple striped cowl she made (four times) for the women in Jordan's family. I really like the same yarn; in fact I had used it for TS Christmas project the second. So I riffed off her project but instead I made a scarf for my dad. I decided to knit my scarf flat but double width, and seam it along the long edge. I used the same needle pattern that I used for my mom's shawl; 3 in work, one out of work, etc. 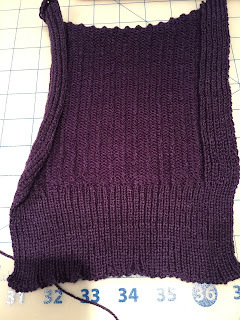 I did a 1x1 rib at each end, and the fact that the ribbing is also in a tube is a little weird, but not unacceptable I like to think. I went with five colours: chocolate, denim blue, sage green, grey and black and calculated how many stripes I'd need to get my desired length (not too long, said my husband) of 54"
I think it took longer to cast off (my achilles heel of machine knitting) and seam it than it did to knit. You already know that I made my mother-in-law a machine knitted shawl. Flushed with my success, I decided to make a second one for my own mother for Christmas, but to "improve" the pattern to get rid of the curling edges. 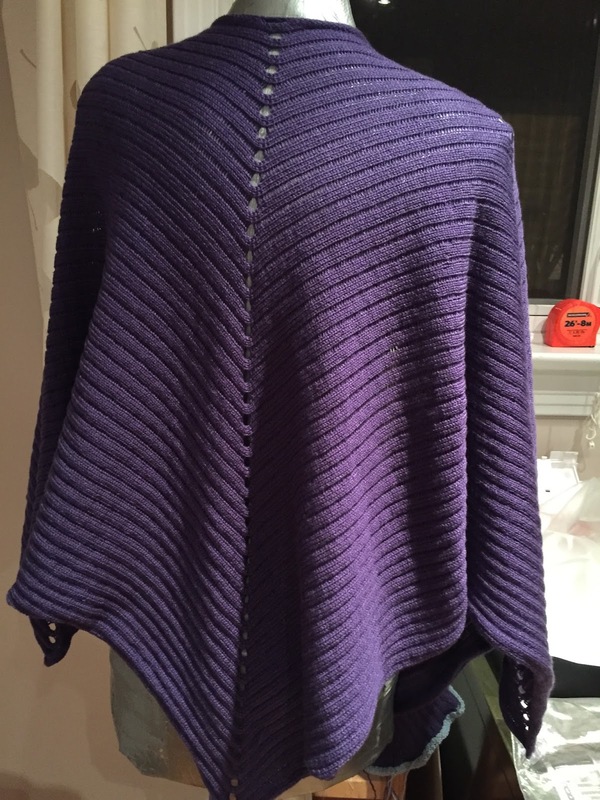 So anyway, shawl #1, while lovely and purple, had ends and edges that rolled to an extent that (in The Sewing Lawyer's opinion) was excessive. 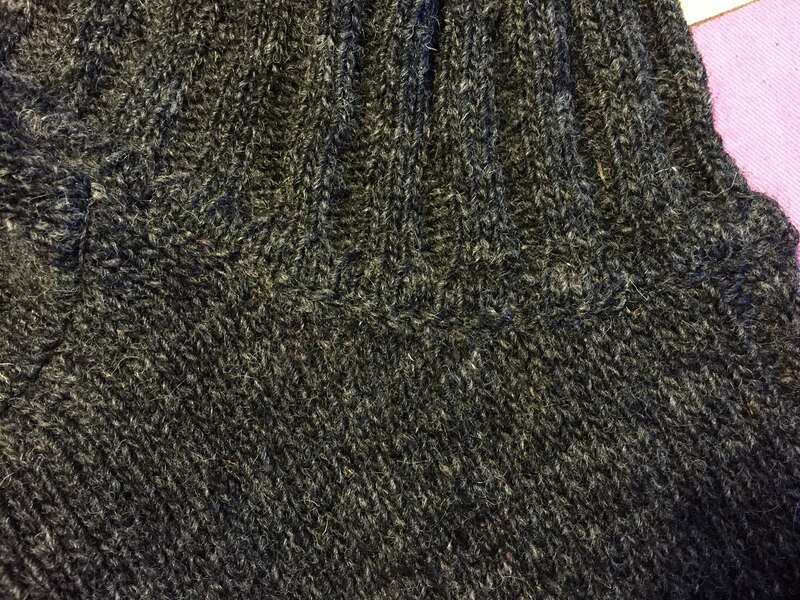 A swatch told me that if I added ribbing at the ends, and along the edges, I could cure the curl. Compare the left and top (curling) and right and bottom (ribbed) edges. I made the entire shawl like this. I will not bore you with the technical difficulties overcome, or the mistakes that had to be fixed/fudged. There were several of each. 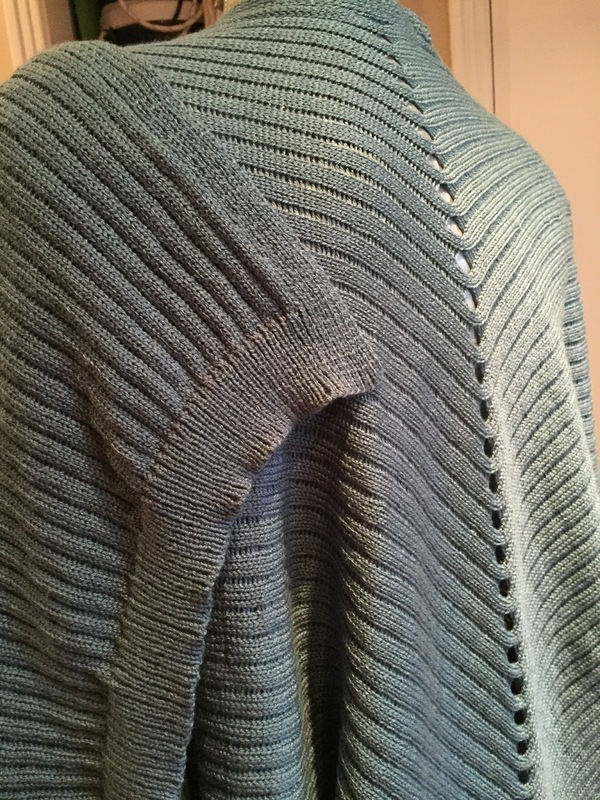 In the end, I had a cushy, seafoam greeny blue coloured shawl, with more or less flat sides (we can live with their occasional tendency to fold back to the wrong side), lovely corners and ribbed ends. 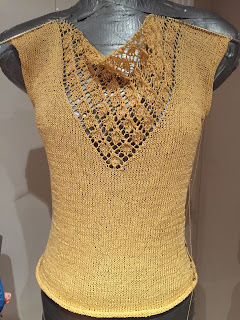 I compulsively scan the newly published patterns on Ravelry. That site is so addictive! I am embarrassed to tell you how many patterns I have faved. So I won't. There are SO many new ones every day. Most of them (between you and me) are supremely awful. Patterns for dishcloths and boot toppers, coffee cup cosies and ugly, chunky cowls. Sorry if you like making such things - I think life is too short. I'm always most interested in the sweaters. 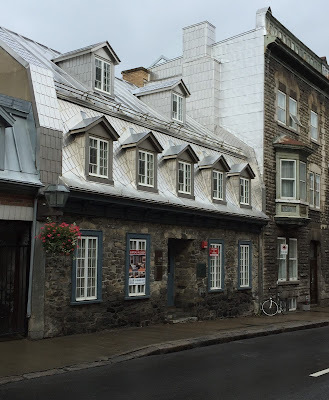 Most of them are also very forgettable, but every so often one comes along that almost takes my breath away. 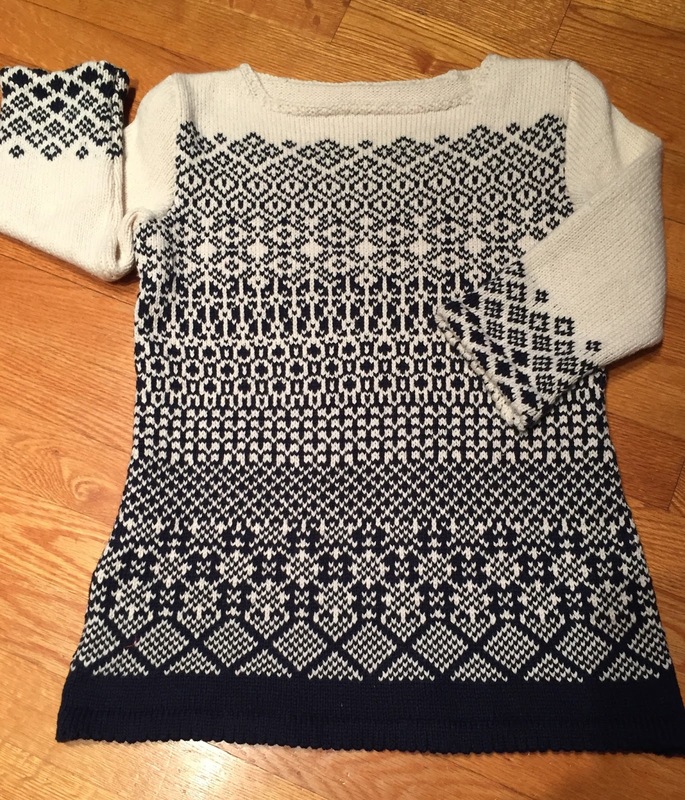 And so it was with "Graphic Sweater" from the Fall 2015 edition of Vogue Knitting. See? 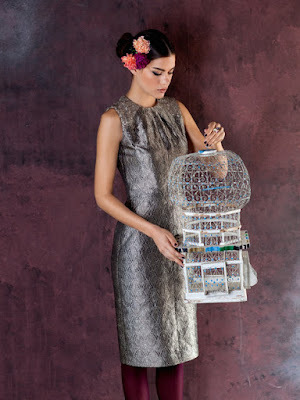 Breathtakingly, riotously patterned. I would never in a million years make such a thing by hand. 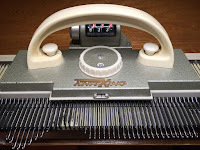 But I have a knitting machine and I know how to make it knit me a crazy stranded pattern. And so I made it. Out of 50-50 cashmere cotton yarn in ecru and darkest navy from my favourite yarn pusher supplier, ColourMart. I would have used wool but the recipient has sensitive skin. Well, this stuff is so soft, you have no idea. What a fun project! Contemplating it led me to get my ancient KnitKing out of the closet and clean it up. It is really an amazing machine, though completely manual. 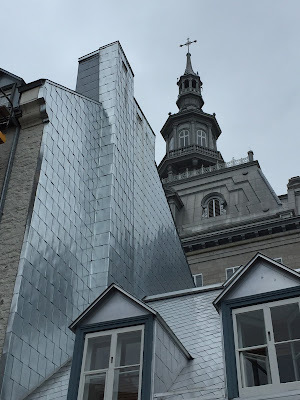 It has a straightforward if somewhat time-consuming way of patterning that is infinitely variable. Unlike people with more complex, more sophisticated machines that use punchcards or other automatic patterning systems, you have to hand-select the needles for knitting with each colour. 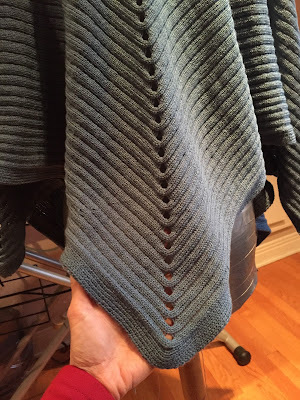 I have a wonderfully simple tool to make it easier with repeating patterns like the ones in my sweater. At about the 2 minute mark in this enchantingly antique video, you can see the knitter using this tool; she's knitting a Norwegian style of patterned sweater on a machine that, so far as I can tell, is just like mine except branded "Knittax" (the brand name was different for Europe). Contemplating this project also led me to get out my brand new version of Excel to plan out the charts because (a) Vogue Knitting editors are apparently incompetent at publishing charts without mistakes and (b) the designer and/or VK editors paid scant attention to the flow of the patterns into each other or their placement on the body. 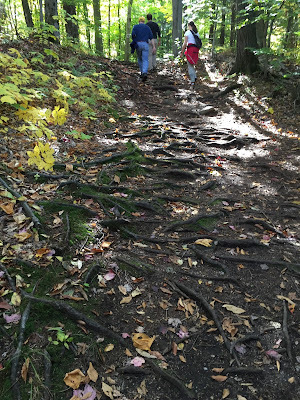 I shifted things around until I was satisfied that they flowed and were more or less centred. Not that you can probably tell, but I also completely redesigned the first chart so that it repeated on the same number of stitches as the second chart above it. This satisfied The Sewing Lawyer's persnickety perfectionism. 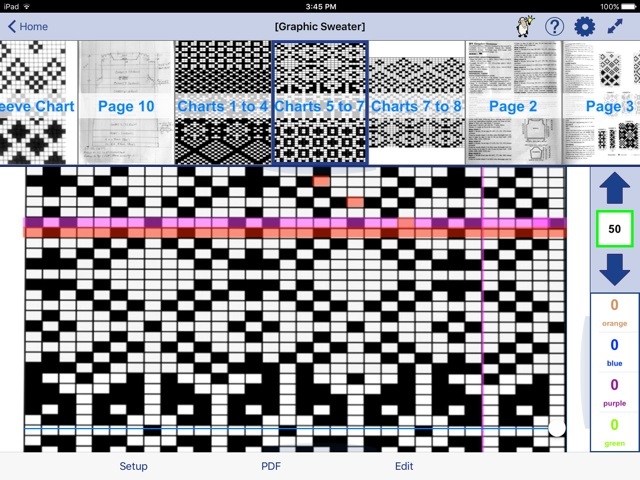 And finally, making this project confirmed me in my love for KnitCompanion, an iPad app that allowed me to easily follow the charts through 80 rows front and back (and 27 on each sleeve) while making only one patterning mistake. You will never get me to reveal where it is. There is something so very charming about making a crazy patterned sweater using computer technology assists for a 50 year old 100% manual knitting machine. I spent the most amazing day machine knitting on Friday, learning from a master (Dresda on Ravelry) who lives quite near to me in a charming converted two room schoolhouse. Her knitting room is in the old teacher's room above the front entry. I noticed there was an open grill between the back wall of the teacher's room and the former classroom below. Miss Smith would miss NOTHING that went on, even when she was upstairs and well out of sight of her pupils. 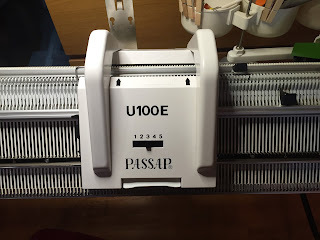 Dresda had offered to show me how to use my U100E, a fancy shmancy device that promises to transfer stitches from the front bed to the back bed, or vice versa, or only some of them (every second one or the specific ones you tell it to transfer) in a single pass. 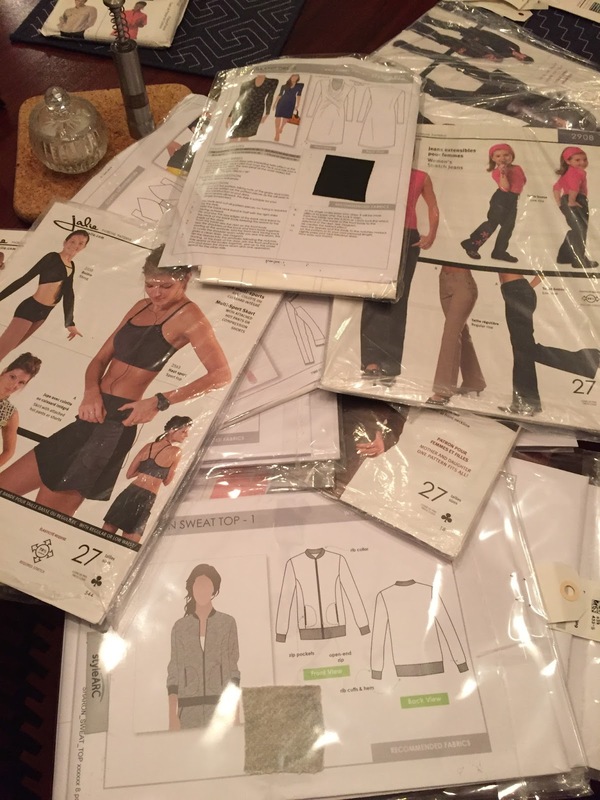 You save precious minutes that otherwise would be spent moving one stitch at a time by hand. 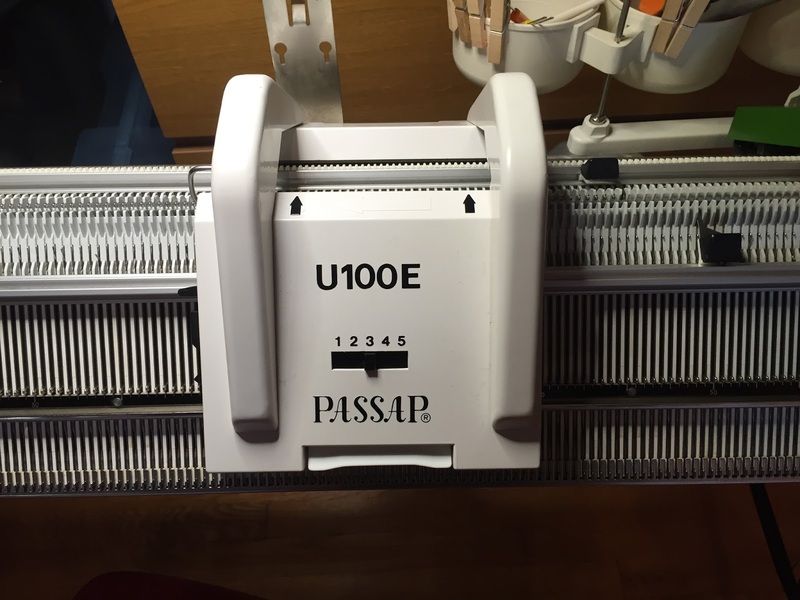 I had bought this thingy with great enthusiasm shortly after I got my Passap Duomatic 80 double bed knitting machine because: Texture! 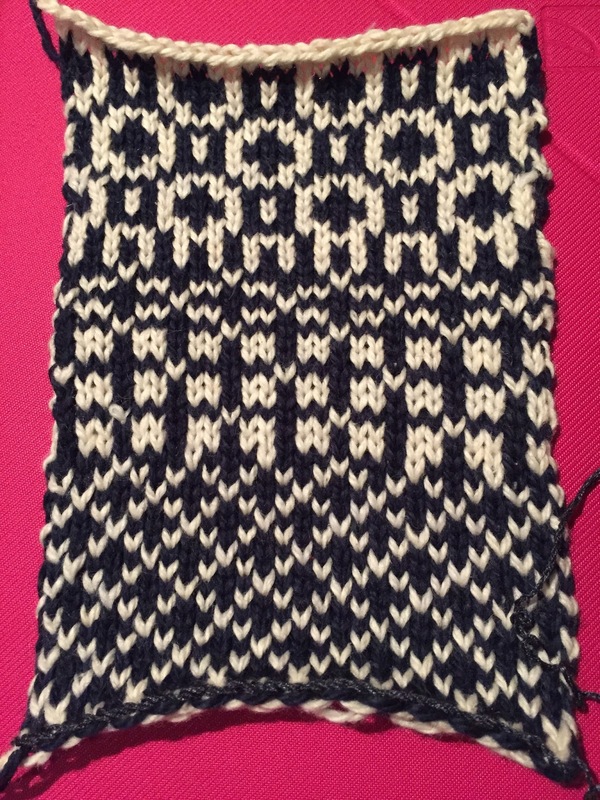 I could do interestingly patterned textured knitting on my machine! Not to mention transfer from ribbing to plain knitting easily. Full of hope, I tried it. Hmmm, not so easy. It transferred most of the stitches, but dropped others. And it got stuck. And I mangled a latch or two in the process. I bought 50 insurance needles. Every time I tried the U100E the same thing happened. So it went back into the box. Which apparently is the same thing that happens to most of these devices. But Dresda said that she could unlock its mysteries for me. And looky! 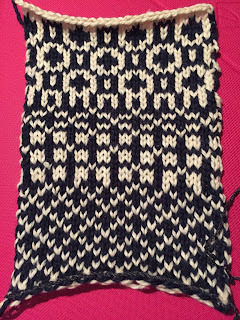 I made an ugly twisted little swatch. But: garter stitch! 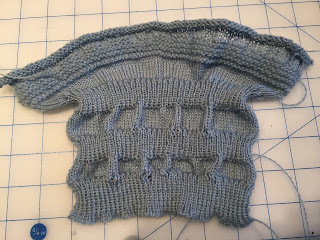 Rib to stockinette! Stockinette to rib! Stockinette to chosen stitches purl! This is a tour de force people! 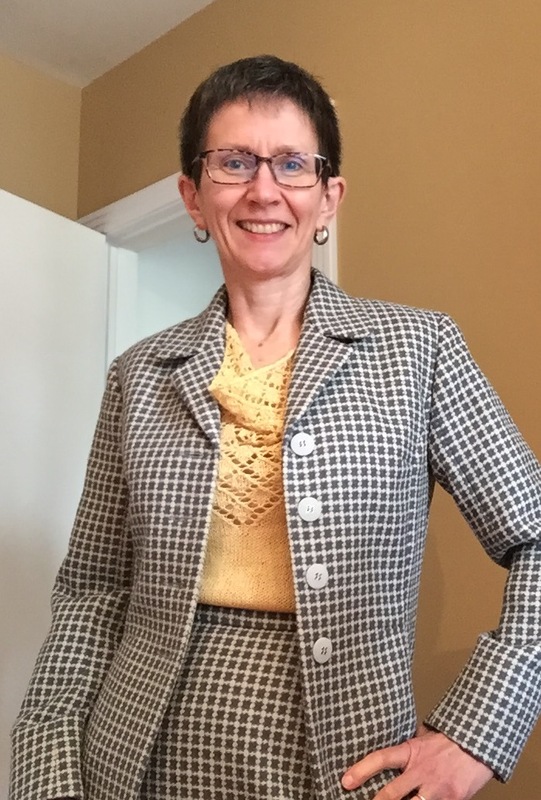 A sewing lawyer can never have too many sheath dresses, right? 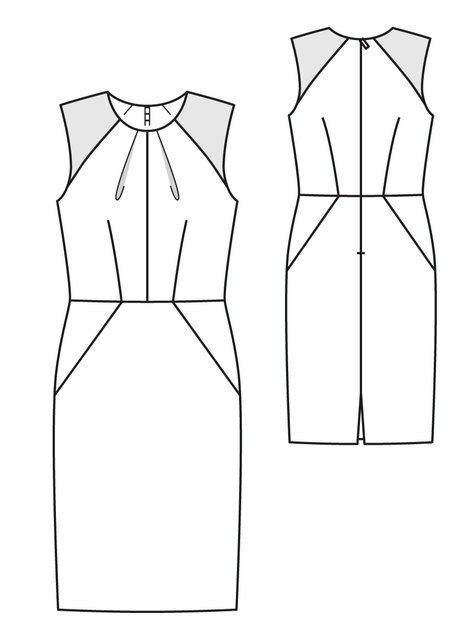 I'm lagging behind so much that I can't even remember if I previously mentioned my idea of making the "seamed dress" from the August, 2012 edition of BurdaStyle magazine. 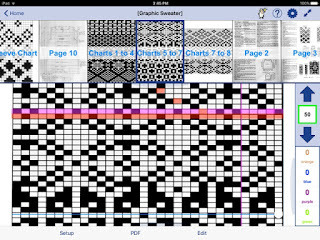 However I looked it up on PatternReview and there were a couple of very nice versions. Then I let the idea percolate in my head for a few months before taking the next step of tracing the pattern. And then I cut a muslin and let it sit for a few weeks while I did other things (secret machine knitting). And yesterday, finally I finished the muslin. Behold my version of the shiny dress. It's too tight. 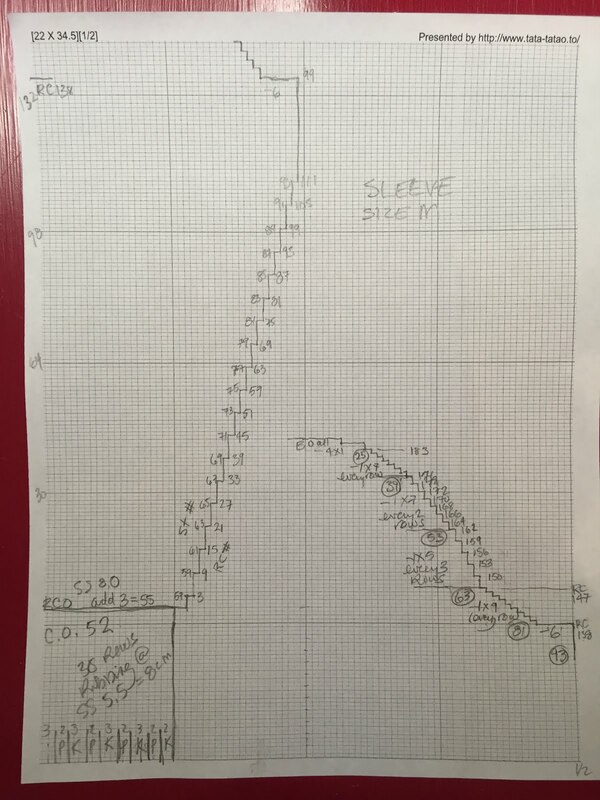 I did a very slap-dash job of grading the hip curve and this fabric has zero give. an 8cm difference in the overall height between the size ranges. I traced without adjusting and (surprise!) I need to pinch out 2cm above my bust. 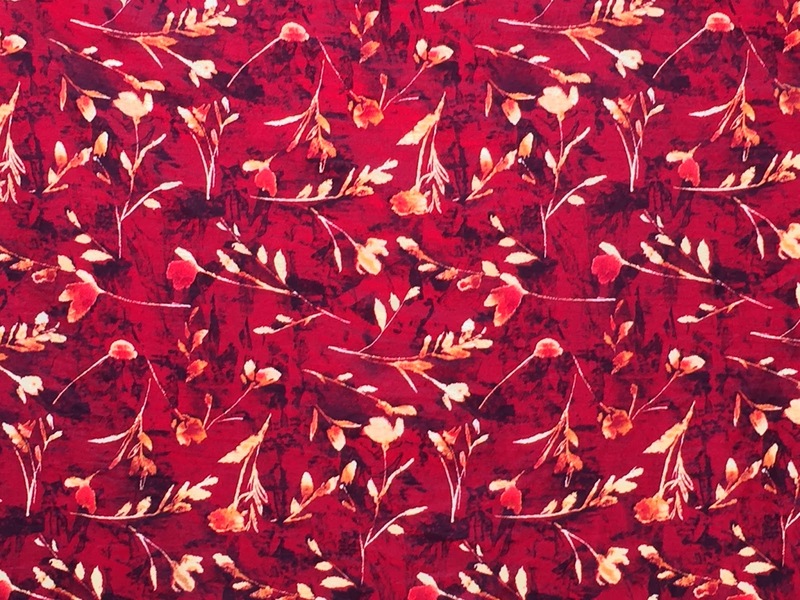 What do I like about this pattern? 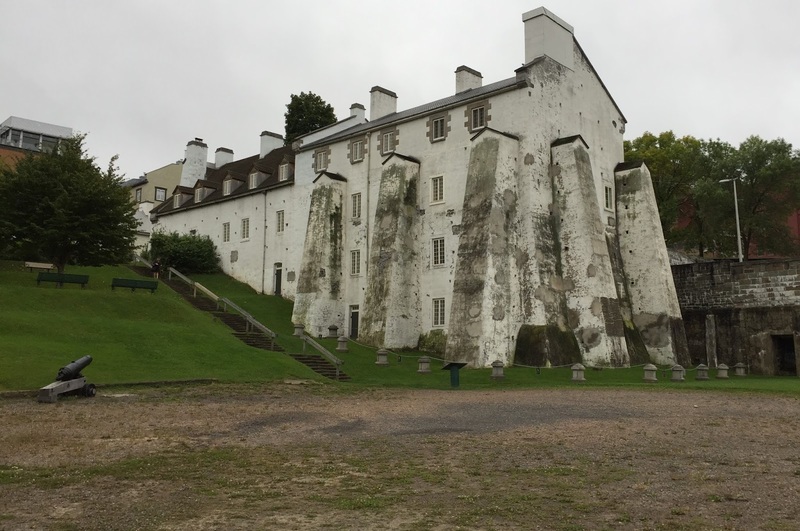 The interesting diagonals. 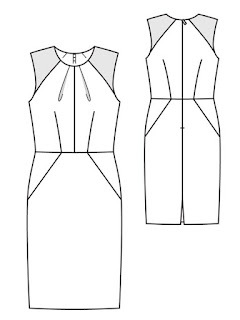 They show up on the line drawing, and I hope to be able to make them pop in the concrete grey wool double crepe I've got lined up for this dress. It may surprise you to learn that there are some extremely active machine knitting groups on Facebook. 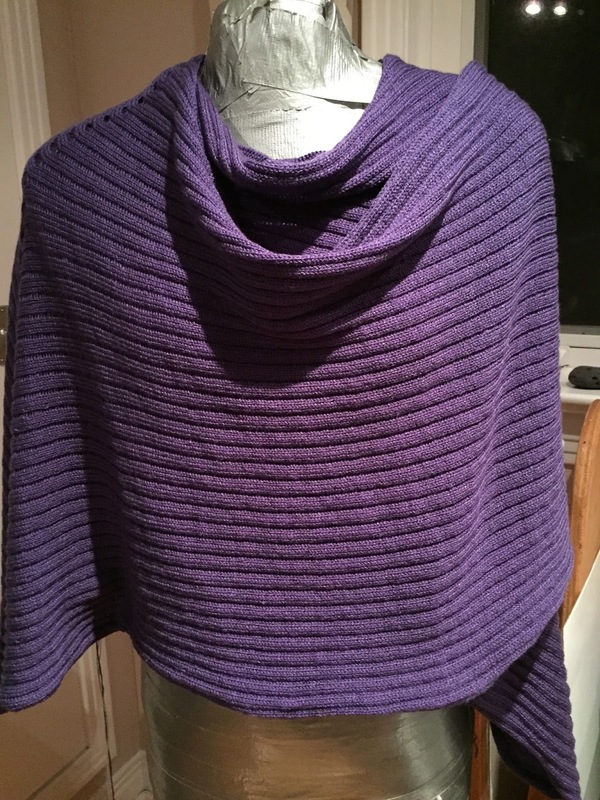 A few months ago, people started to post photos of a faux-ribbed shawl that became known as "Christine's Shawl" after its designer, Christine B. Linfield. 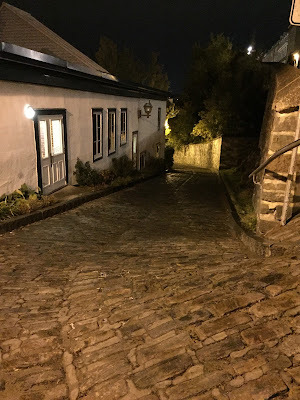 The instructions are posted in the group's documents, free for anyone who's a member of the group to use. 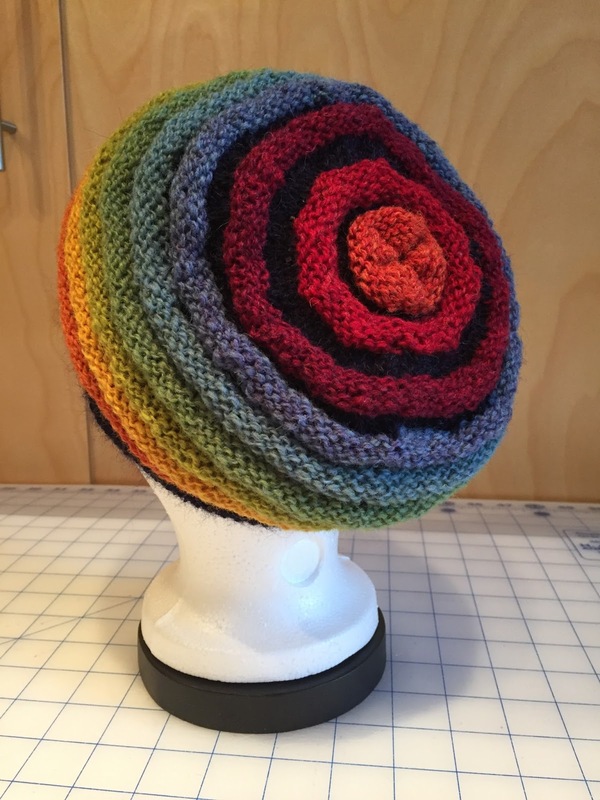 There's a link on the Ravelry pattern page. 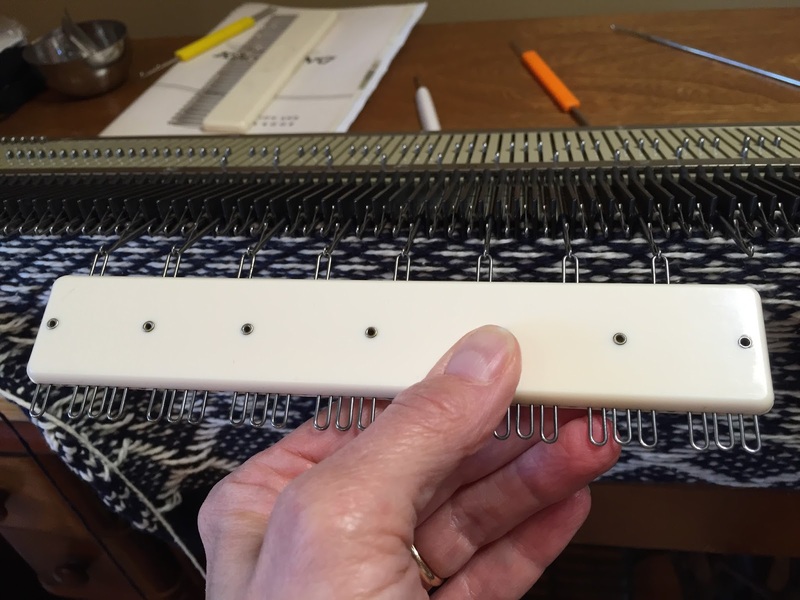 Basically, you knit a long piece using the full bed (180 needles) of a standard gauge machine. Every 4th needle is out of work, which creates the ribbed appearance. 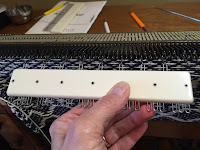 Then you do short rows, by putting the first group of 3 needles out of work and knitting 4 rows, and repeating with each successive group of 3 needles. Then you bring all the groups of needles back into work in reverse order. This creates a line of eyelets and makes your shawl turn a corner. The shawl has 3 such corners - one over each shoulder and one at CB. The pattern is extremely easy and I originally thought it wasn't a very interesting shawl. However, I started to think about what to make for my 90+ year old mother in law who's in a nursing home, and realized that this shawl in her favourite colour could be just the thing. I started it on Sunday and would have finished it in one go, but for the fact that I realized I was going to run out of yarn. 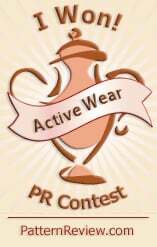 I did the second half on Tuesday evening. It took me longer to finish the ends of the shawl, which I did with a sort of backwards single crochet. I may make another one of these. It's very cozy! Oh yeah, I also made a hat. This is based somewhat loosely on Wurm, a free pattern on Ravelry. 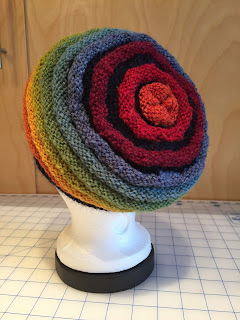 I used the second half of my rainbow skein of Kauni Effectgarn. It's totally a trick, that yarn. 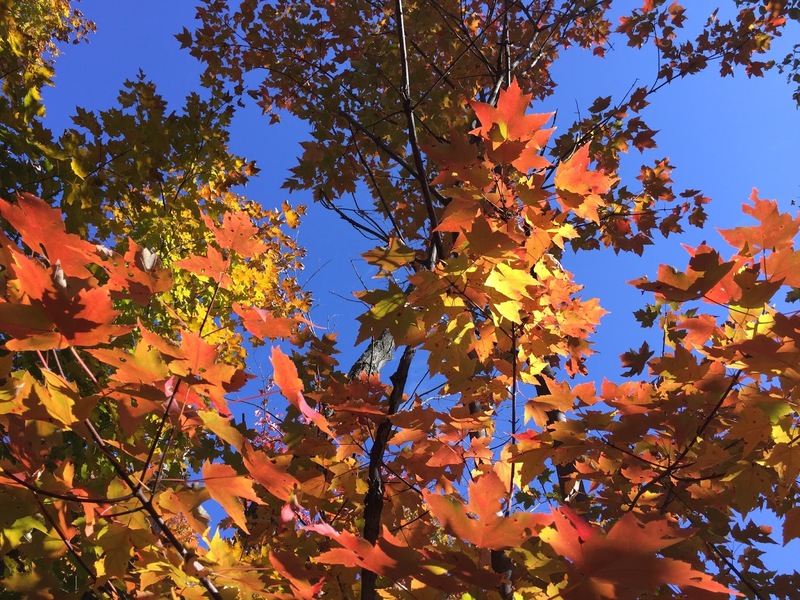 It shifts colour very leisurely so that before you know it, you've gone through the whole rainbow spectrum. The second half? 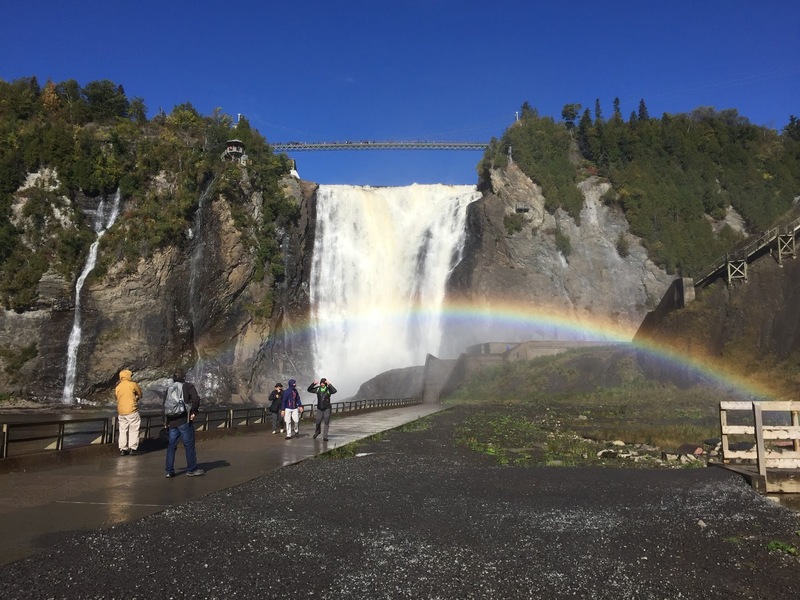 Oops, I guess I must have forgotten to blog my Rainbow scarf/shawl. I finished it in early summer but now, I'm finding that it goes with just about every single thing I own. 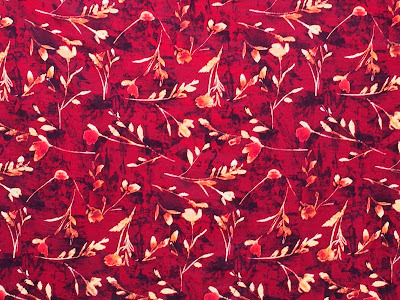 The pattern for this one (not free) is written specially for the Kauni's long colour changes. 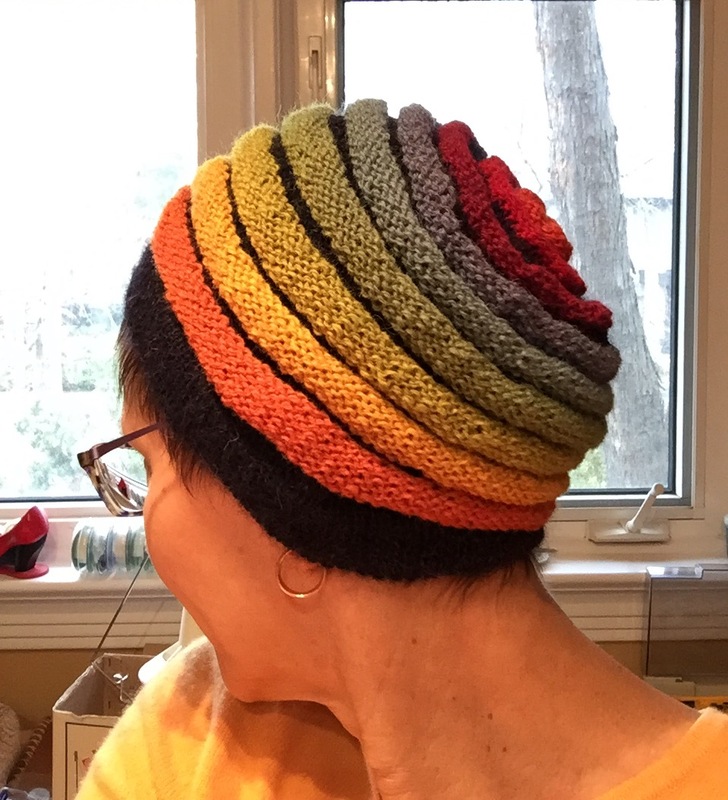 Back to the hat - I made some changes to make it better than the pattern. 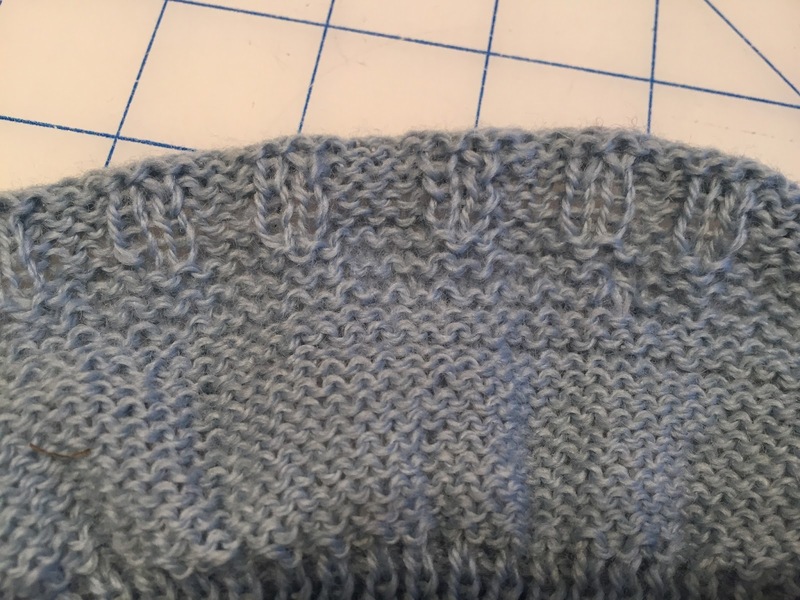 Specifically, I knitted the first row of each of the purl ridges as a knit row (to hide the transition better), and I hid decreases in the dark rounds so that my hat has a pleasant beehive shape rather than being long and kind of square at the end. Unfortunately my skein of Kauni only had one bit that was truly purple so the colour transitions at the back of my hat (which are engineered; I have a lot of tiny skeins of the intermediate colours) are not as gentle as they could be. But I am pretty well satisfied with my new hat. It'll add a pop of colour when I wear my severe navy coat, once the weather turns really cold.